Even if a Barista can create awesome latte art what’s the point of drinking it if the coffee tastes awful? Luckily, pulling the perfect shot is not rocket science, it’s easy to reproduce after a few good attempts. What Is The Perfect Espresso Shot? There’s nothing better in the world than drinking a perfectly made coffee, and it all begins with a great shot of espresso. A well extracted shot will bring out the subtle traits and earthy undertones of a coffee blend. The coffee would not be bitter or acidic, rather balanced in its flavour. A clean machine and group head is as important as the shot itself. Each time before a new shot is made you have to ensure that the group head is clean and there is no left over coffee from the previous shot. The best way to do this is to first purge the coffee machine (run the water without the group head in it) and then clean out the group head with a dry towel/cloth. Once the coffee machine is clean we grind the coffee into the group head. This step will vary with the equipment you have. Some cafes have automatic grinders, others have a dose based ones. However, what is most important is to have freshly ground coffee that is no more than 5 weeks old from the roast date — ideally at least 1 week old. You are looking to grind about 18 grams of coffee for a double shot basket to a fine consistency within the group head. Level the ground coffee in the group head with either a flat finger/leveller or give the group head a couple of gentle taps on your table top/bench to distribute the grind evenly. Next rest your group head parallel to your bench. Grab your tamp and place it gently on top of the ground coffee in your group. Apply about 15kgs (30 pounds) of pressure directly down on the coffee. On your way up, twist the tamp 90 degrees to create a flat surface. Remember this is a simple motion; there is no need for extra clicks, knocks or coffee making rituals — just a simple push and twist. Next insert your tamped coffee immediately into the coffee machine for extracting to prevent the coffee from being burnt. You want your shot to pour out of your espresso machine between 25-30seconds. This area of time ensures the best tasting espresso and it all depends upon the previous steps taken. A word of caution though, the coffee time will change multiple times throughout the day due to factors such as humidity, the fineness of the coffee grind and the barista making the coffee. So make sure to check all the previous variables every hour to ensure consistently well made espresso. 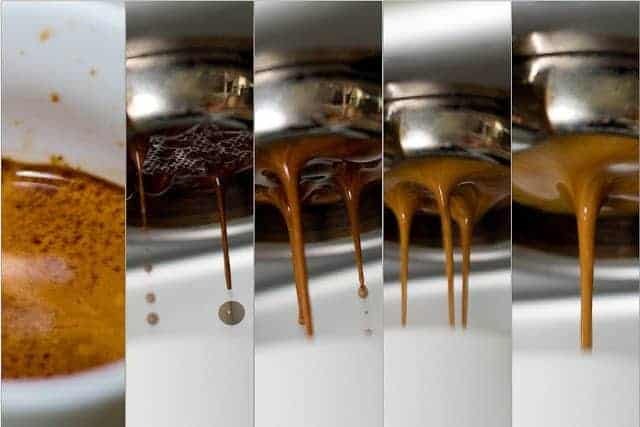 The final step is one of the most neglected when making espresso — tasting your coffee! Baristas are like chefs; very specialised chefs. And what do chefs do before serving their meals? They taste their food! Baristas should do the same. There’s no better final quality control than a final taste test. Of course this can’t be done all the time, but at least 3 times a day: once in the morning when opening the store, another at midday, and the third after the day’s busy rush. And there we have it. Follow the above steps and you’ll be slinging excellent espresso throughout the day in no time. But as always, practise makes perfect so make sure to test out the above guide in action. Also make sure to check out our milk steaming guide to match your espresso with great milk!